Top Ten Tuesday is a weekly meme/feature hosted by The Broke and the Bookish. This week’s topic is: Books on Your Fall TBR List. There are so many amazing books I want to read this fall, but sadly, I don’t think I’ll have the time. Also, fall seems to be when I tend to fall into reading slumps. Really, really bad reading slumps. All that aside, I really hope to read these ten books before winter comes. There are so many great fall releases it would be impossible to list all of those I want to read on top of already released books, but I’m gonna narrow my list down to only ten. Some of these I may end u reading during winter, but whatever. I’m even more excited for this book than I am for Heartless. Actually, I don’t think I’ve ever been this excited for a book to come out. Six of Crows is one of my favorite books, well, ever, and I’m sure Crooked Kingdom will be even better. I didn’t think it was possible for a book to be better than Six of Crows, but I’m counting on Leigh Bardugo for this one. If you didn’t already know, I’m basically the biggest fan of Six of Crows EVER. I love the Grisha trilogy, but Six of Crows is even better. I love books with dark themes so much, and I’ve heard this one is SUPER dark. The word Dark is even in the title. This book sounds super interesting and unlike anything I’ve read before, so I’m really excited for when I can finally read it. Plus, that cover is so gorgeous *heart eyes*. Three Dark Crowns is about three sisters who, as I believe, have to kind of fight for the crown. It sounds really interesting though. The Young Elites is amazing, so I can’t wait to read this book. I keep seeing all these photos on Instagram of people who already have ARCs. How? How do you get ARCs though? If someone gave me an arc of The Midnight Star I think I would die. I’m really hoping to read this book soon though, I’m really excited to see how this series plays out and what happens to Adelina. Also, am I the only one who hopes she doesn’t end up in a relationship with anyone? I think Adelina is much stronger on her own and I don’t really ship her with any of the love interests. So, this book is basically historical fiction (my favorite!!!! ), but also not…? I don’t really know, but it sounds like it will be a really good book. The main character can (from what I’ve read) burst into flames, which sounds SO COOL! I will admit fire kind of freaks me out, but could you imagine having the ability to burst into flames? I would do it solely for the purpose of seeing other people’s reactions. Anyways, this book sounds really interesting so I’m also very excited to read it. I bought this book last month and have been wanting to read it for so long, but I still haven’t yet. Why? I honestly don’t know. I blame it on all the awesome new releases coming out recently. I really want to read this soon though, preferably in the month of October. I’ve heard mixed reviews about this book (insta-love, annoying main character, etc.) but I wanted to try it out, and hopefully I’ll like it. I read Rebel Spring so long ago, but still haven’t read Gathering Darkness. Urghhh, I don’t even own a copy of it, it’s just been in my Amazon carts for months now. It’s not that I don’t want to read this, because I really do, there are just other books I would rather order/read first. Sorry Gathering Darkness, but it’s true. I’ll read you someday though, just you wait (Hamilton, anyone?). There isn’t much I’m going to say about these because I’m currently reading The Dream Thieves, but I will say that I plan on finishing this series within the next two months. The first one was amazing and I’m loving the second one, so there is no doubt in my mind that the books are just going to keep on getting better. To be honest, I don’t really have an opinion on An Ember in the Ashes. I read it, I was kind of confused, I gave it three stars, and then I waited to read the next book. This isn’t like one of my top I can’t wait books, but I already own a copy, so I might as well read it. Plus, I’m actually kind of curious to see what happens. The only character I remember that much from the first book is Helene and she gets a POV in this book. So, those were ten books I hope to read in the next two-and-a-half months. I also actually really want to read the Ron Chernow bio of Hamilton too, but I doubt that’ll be anytime soon. I mean, that book is HUGE. What do you plan on reading this fall? Hope you enjoy the rest of The Raven Cycle! Thank you! The first two books have been amazing so there is no doubt in my mind the last two won’t be. Me too! I loved The Dream Thieves (I just posted a review on it, actually), it was amazing! I hope you enjoy it, too. Thanks, I’m hoping to like it more than I liked Ember. 🙂 That’s too bad though. 🙁 I was really looking forward to Three Dark Crowns being super dark and creepy. Oh well, I’m still really looking forward to reading it. I hope you enjoy the rest of The Raven Cycle! It’s one of my favorite series ever. Also bless that Hamilton reference. Thank you! The first two books were AMAZING so I now the next two have to be, too. I mean, there’s no way they could be any less than amazing. Hamilton has taken over my life such that normal phrases and sentences immediately make me think of it. I would have used that phrase all the time before listening to it, but now it’s just embedded in my brain as Hamilton, ha! 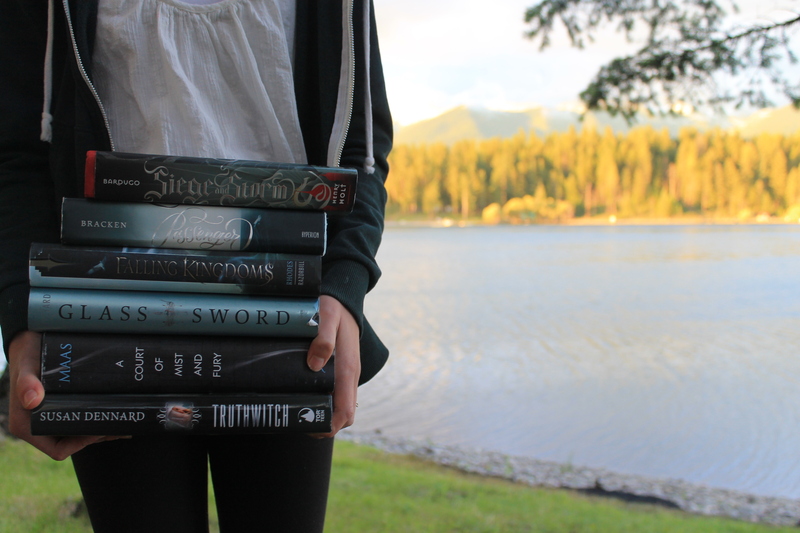 These are all books I need to read – especially Heartless, The Kiss of Deception, and A Torch Against the Night. I feel so behind because I haven’t been reading as much lately! Don’t worry, I haven’t been able to read much either. I mean six books this past month is very low for me, especially considering how well I’ve been doing this year. Fall is always when I fall into slumps though. I blame it on Throne of Glass. I hope you enjoy those books as well though! i can’t wait to read them.